Although the adult Wechsler intelligence battery (WAIS-R; WAIS-III; WAIS-IV) is the most frequently used intelligence battery in Atkins cases (often called the "gold standard"), other intelligence tests are starting to show up in psychological reports. These other tests are either newer intelligence batteries (first editions published in the past 30 years), revisions of older batteries (e.g., Stanford-Binet), or are tests reflecting scores from a test taken while a defendent was in school (and the battery only providesnorms for school-age populations). Over time I will be presenting information that will allow readers to better understand the similarities and differences of these different batteries, with a particular focus on why they may provide different scores. First, as I've mentioned before, in 2002 a national panel of experts made recommendations re: the use of intelligence and adaptive behavior tests in MR/ID eligibility determination (for SSA benefits). In that publication a table was presented that listed the comprehensive intelligence batteries deemed suitable for MR/ID determination. The table can be viewed by clicking here. Only three of the batteries listed at that time had adult norms. Also, many of the tests have since been revised/renormed--thus making the basic information in the table out-of-date. The important point is that there are other intelligence tests (beyond the Wechsler "gold standard") that have been deemed appropriate for MR/ID identification/Dx/classifcation by a national panel of experts. 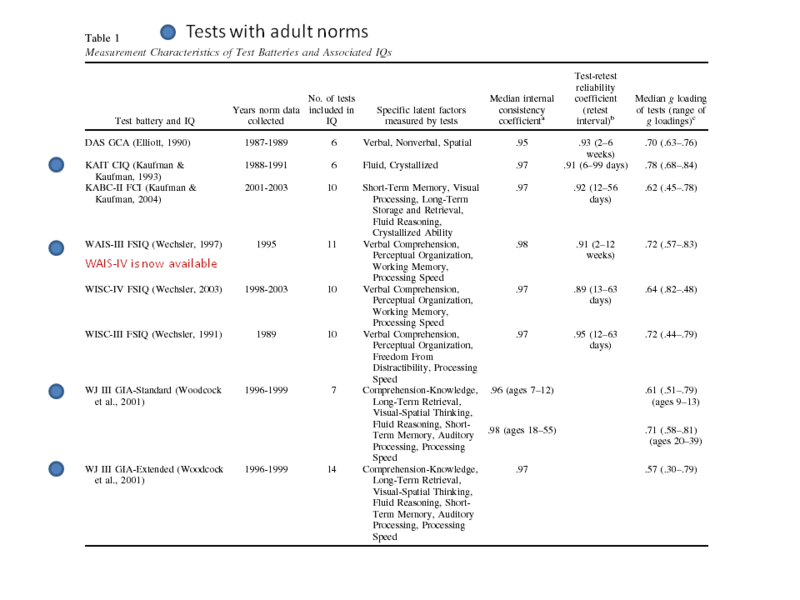 Floyd, Clark and Shadish (2008) reported on the exchangability of full scale IQ scores from most of the major comprehensive intelligence batteries. In that article they provide an excellent descriptive summary table of the major characteristics of the respective test batteries. This table is reproduced below...with a few annotations. [Click here for a larger version of the table image - when image appears, click on it to make it bigger]. Finally, the Floyd et al. article makes reference to supplementary material availbale upon request. One piece of this supplementary information is a lengthy footnote describing the various full scale IQ scores (which are typically the primary focus in Atkins cases...for good or bad) available from the different IQ batteries. I've reproduced the footnote (with embedded URL links to the product descripton web page of each respective publisher)--click here to view. Thats enough for now. This is just a start in ICDPs attempt to provide comparative information on intelligence test results that may appear in psychological reports reviewed in Atkins cases.